This series, thought to no longer exist, was recently discovered in its entirety. The discs were still packed in their original shipping boxes from ARC Sydney, and are in excellent condition. Also accompanying the transcription discs were the special episode insert recordings to introduce the series. 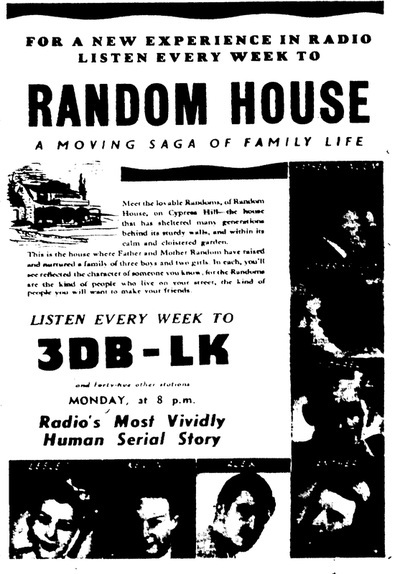 The serial was originally sponsored by the Banks Central Committee, and the insert advertising discs also accompany the serial. I would consider this a major find, adding another piece into the jigsaw puzzle of Australian OTR. As an interesting aside here, we have Peter Finch playing a major role in this series, and this would be his last role in an Australian radio serial before he left for England in late 1948. Sir Laurence Olivier, visiting Australia at this time observed Peter in some stage performances and advised him he would do well in England. Upon this advice, Peter left for England for pastures greener. 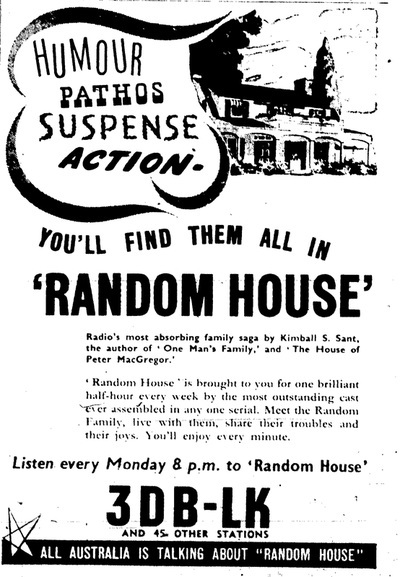 This actual turn of events is written into the final episodes of Random House. Michael Random (Peter Finch) is to leave for England to start a new career. He receives a letter from a certain "Sir Laurence" inviting him to start a new job there. This serial really did reflect the true happenings in life. 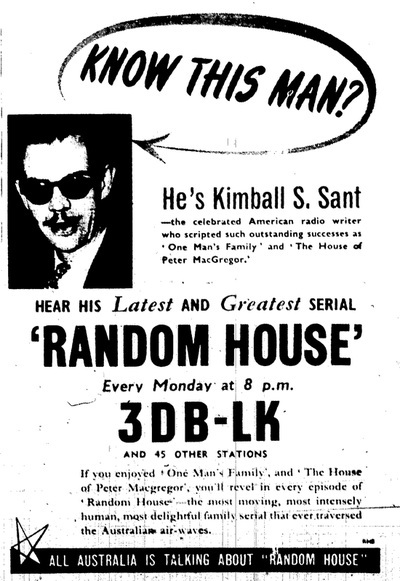 One of the shortest lived production houses, Dr. Gilbert S. Sant, an American, attempted to break into local Australian radio production. (at one time he was chief producer at the C. P. MacGregor studios in the USA). Other local productions to his credit - Curtain Call, and……. A special farewell broadcast presentation play featuring Sir Laurence Olivier and Vivian Leigh was aired on the 5th September 1948 on a national network of stations. The broadcast, which was to aid a special Food for Britain appeal, sponsored by the Oliviers and supported by the Associated Banks, ended with an obviously sincere message in duologue form, in which Sir Laurence and his lady returned thanks for memories which they said they would treasure for the rest of their lives, and said au revoir, but not goodbye. 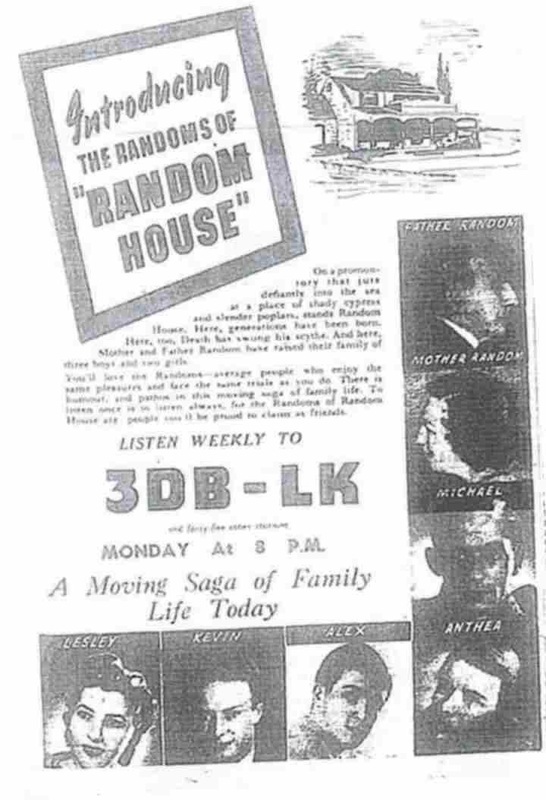 Others who shared in the credit for this memorable broadcast were Peter Finch, who introduced the artists and filled in the few gaps with a good job as compere, and Kimball S. Sant, American scripter – producer, who composed and produced the whole presentation. As yet there is no information explaining the rapid demise of Kimball S. Sant Productions. 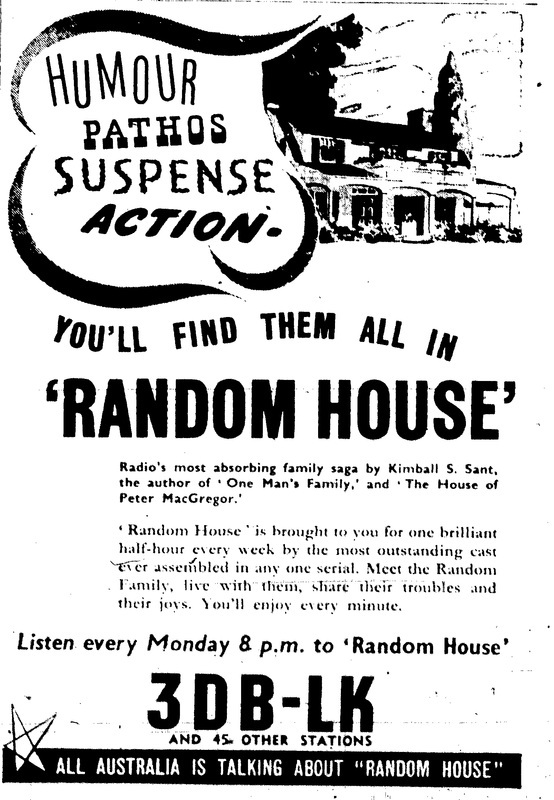 It seems Random House production was wrapped up soon after ARC took over from Kimball S. Sant. Discs pressed by the Australian Record Company, initially on the Sant Radio Productions label, then subsequently on the ARC label. 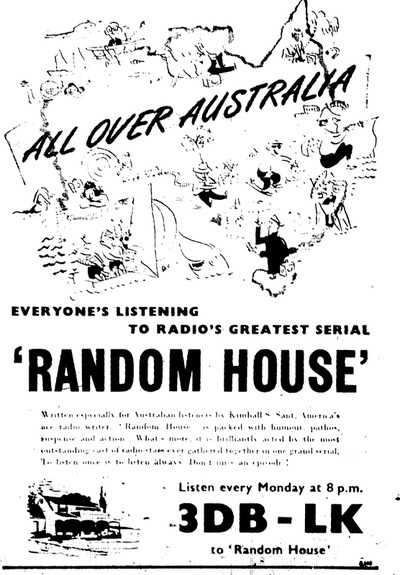 Theme and incidental music specially composed for the series by Sydney John Kay with the title of "Our Home"
Lyrics were written by Russell Scott (of Youth Show fame) Music recorded for the series in Sydney and available on the Rondex series of theme and title music discs. pleasures and face the same trials as you do. There is humor, and pathos in this moving saga of family life. 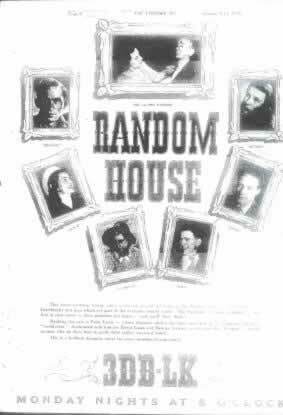 To listen once is to listen always, for the Randoms of Random House are people you'll be proud to claim as friends. made in Melbourne and went on for well over a thousand episodes….but that’s another story. There is certainly a direct similarity between these two serials. INFORMATION COMPILED BY CRAIG NUGENT. Acknowledgements - Moris Sztajer for verification of some facts and supply of newspaper adverts.